Provide comfort for the family of Edith Raney with a meaningful gesture of sympathy. Edith Lilly Raney was born June 2, 1940 in Quinton, OK the daughter of William and Bertha Leora (Turner) Bray. 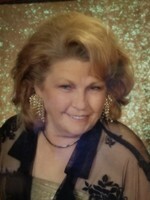 She passed from this life on March 27, 2019 in Muskogee. She was 78. Edith grew up and attended school in Kinta, OK before moving to Eakly, OK for several years. Edith had worked as a nurse’s aid for nursing homes in the Muskogee area. She loved the outdoors and spent many hours fishing, gardening, camping, traveling and hunting for poke salad. She also loved her family and enjoyed hosting big family dinners at her home. Survivors include her son Daniel Bohannan and fiancée Guin Brown of Muskogee, one brother Johnny Bray of Quinton; six grandchildren, William Ellis and wife Kelly, Derek Bohannan and wife Andi, Christopher Haydock and wife Tina, Christina Green and husband Doss, Jennifer Ellis, Dustin Gorman and seven great grandchildren. She was preceded in death by her husband, John Henry Raney, her parents, two children, Edith Ellis and Lee A. Lanier and twelve brothers and sisters. Funeral services will be held at 2 pm Tuesday April 2, 2019 at the Oasis Community Church with Rev. Rodney Mattox officiating. Interment will follow in the Mountain Home Cemetery near Quinton OK under the direction of Lescher-Millsap Funeral Home. Viewing will be Monday from 10 am to 7 pm. To send flowers in memory of Edith Lilly Raney, please visit our Heartfelt Sympathies Store.